I can;t believe it took me over 30 years to finally hear this album, but that’s the sad truth. 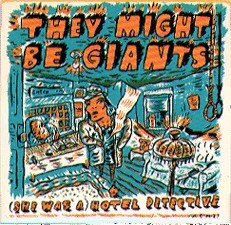 At first, the TMBG debut album was LP only in that nether period where not all new albums in the mid-80s were released on CD. I remember seeing the LP at first but not the CD. I only bought the CD-3 singles release from it at the time. The CD of this then became available but I never got around to picking it up. Instead, I bought their next three albums and any singles released from them until the fateful year of 1993, whereupon I simply stopped buying any TMBG music for reasons unknown. It’s been a looooong time since I’ve fired up any of the TMBG in the Record Cell. I only really know their short, sharp, surreal early period, but maybe because this was the first album [that I never heard] I was actually surprised by the abrupt shifts in tone and willful embrace of non sequitur that the band employed. While huge chunks of this are gleeful pop, there were aspects of this that strongly recalled The Residents. Especially during their “Commercial Album” period full of songs this brief. Some of the juxtapositions the band favored could be just as dark as with The Residents. The instrumentation of guitars, saxes, and accordion with drum machine and sampler was both of its time and completely out of it. I did not expect the hints of country music that could be found in the mix, as on “Alienation’s For The Rich,” but with a band this eclectic, I should not have been surprised. I was also jarred by the appearance of guest vocalist Margaret Seiler on the unsettling “Boat Of Car” but not as much as by the slightly arrhythmic sample in the song of Johnny Cash saying “daddy sang…bass” that manifested there. It is now lodged in my mind… haunting me. The single “[She Was a] Hotel Detective” was still a rousingly great appropriation of rock tropes pushed slightly into the red by the hint of madness in the band’s demeanor. Their usage of manic laughter for an effect that’s both giddy and unsettling was always a part of this song, but also manifests variously throughout the album. It managed to count as a stylistic leitmotif for them this time out. This band were immediately appealing to me when their video for “Put Your Hand Inside The Puppet Head” managed to eke out a space on MTV’s 120 Minutes back in 1986. Strangely enough, there was only an obscure sub-indie split 7″ EP for the song; not a single as such, and yet they filmed a video for it. And it got on MTV. I’d always assumed that there had been a Bar None Records single of it on vinyl only, but no. This was wrong. Their first Bar None single was the ebullient “Don’t Let’s Start,” which I did buy on CD-3 at the time. CONCLUSION: enjoy…what took me so long? This entry was posted in 30 Days - 30 Albums, Record Review and tagged 1986, 1987, They Might Be Giants. Bookmark the permalink. So was Sparks the TMBG of the 70s or TMBG the Sparks of the 80s? 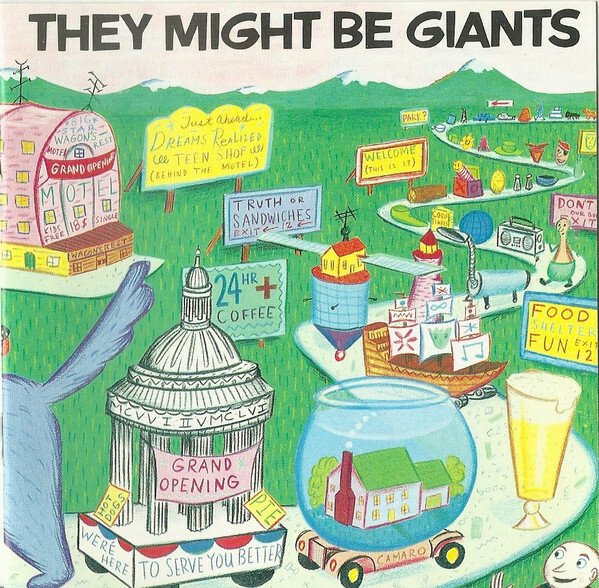 Anyway, I was also really into TMBG (I saw them live a couple of times) until about 1996. I think that for some reason they lost something when they went to a full band format. They are still plugging away, which is great. As for myself, I’m content with Then, which is a compilation of all their early stuff & the Rhino compilation which includes their theme for “Malcolm In The Middle”. When I heard that they went to a full band that may have been the catalyst for my ennui. Now there’s a loaded phrase! I too dropped TMBG for a while after they went to a full band, but it was just the change that was jarring — they are still a surreal, ebullient, amazing group and the current lineup (which has been the lineup for a decade or so now, if not longer) is incredibly tight and focused, and continue to be one of my core bands (so much so that I was actually in a TMBG cover band!). Comparing that album to the most recent one of theirs I have, I’d say that in truth they’ve barely changed (apart from a weird little obsession with random electro-squelch John L was going through for a while) — with approximately the same number of stone-cold classics in their 20th album as was on their first, IMO. Nostalgia obviously makes those first four albums super-special to any long-time fan, but pick any of their last 10 albums, and you can find at least 25 percent on any of ’em that takes you to the same place that their best early songs do. They push my pleasure buttons pretty hard, those guys, and they’re flat-out the most fun live act this side of Weird Al.